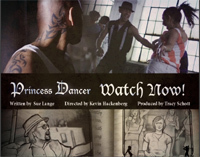 Princess Dancer is a short story of Sue’s that appeared in the Beyond Grimm e-anthology published in March by Book View Cafe. The story is based on Twelve Dancing Princesses and includes two different types of dance and she thought itwould make a nice visual presentation. Tracy Schott produced the video, Kevin Hackenberg organized the shoot and all post-production. There was a whole slew of people—dancers, actors, tech people—involved. Enjoy the video! | Buy the book.